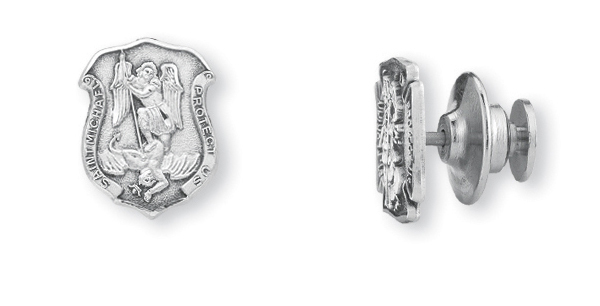 1/2" Sterling Silver St. Michael Lapel Pin with Deluxe Screw on back. The Police Badge Shaped Medal is adorned with a Depiction of St. Michael Slaying Lucifer. The design of this medal was hand-sculpted by master artisans in the early 1900's. The medal is made by Die Striking high-grade Sterling Silver stock. This method enables the finest details of the precious metal to fully show, and the medal is made even more beautiful when the signature Antique Finish is applied by hand to the medal. In the final step, the medal is highlighted with hand engraving, to display the beautiful natural sheen of pure Sterling Silver. When does it ship? This item ships the next business day. This Sterling St. Michael- "Police Badge" Lapel Pin is made in the USA. *Please note: Item dimensions include the attached 1/8" ring. This Porcelain Perpetual Help Pendant available from CatholicShop.com features dimensions of 25 X 19.50 millimeters, approximately 1-inch by 3/4-inch. Made of 14K Yellow Gold, this religious jewelry piece weighs approximately 0.52 grams. It comes ready to give as a gift in a free deluxe gift box. When will it ship? : Orders placed before 6 PM (EST) ship the same business day. Overnight is available. Use our Free Shipping option or upgrade to an express method during checkout. Chain: This medal does not come with a chain, but it does come with an attached bale to fit any chain. See our 14K gold chains. This Religious Coin Token - St Michael for Servicemen can only be purchased in these bulk lots of 25 units at a discounted wholesale price, which is now available to the public. These discounted bulk packs offer the perfect solution if you want to give these Catholic goods away as gifts or to use as free envangelizing tools. Imported from Italy. This Small Holy Spirit Oxidized Medal- Murillo can only be purchased in these bulk lots of 25 units at a discounted wholesale price, which is now available to the public. These discounted bulk packs offer the perfect solution if you want to give these Catholic goods away as gifts or to use as free envangelizing tools. Imported from Italy. Our St Michael Prayer Card Set features our money-back guarantee. Our 6" Pewter Confirmation Cross features our money-back guarantee. Our Miraculous Pin/Prayer Card Set features our money-back guarantee. 1/2"Solid Sterling Silver Saint Florian Lapel Pin, with Deluxe Screw Back. This Saint Florian-Firefighter Lapel Pin is made in the USA. Get 25 pieces for one low bulk price with our 25-Pack of The Lord'S Prayer/Sacred Heart Holy Card. Only available in this bulk pack. The Lord's Prayer Clear Laminated Italian holy cards with Gold Accents. Features World Famous Fratelli-Bonella Artwork. 2.5'' x 4.5'' 25 Per Pack. Our St Christopher Key Chain 3-Pack features 3 units for one low price. 1.75'' Saint Christopher Key Chain (Silver). This Sterling St. Michael- "Police Badge" Lapel Pin has passed our quality control assessment and meets our strict criteria to be a Catholic Shop product. Buy with confidence. Wonderful products just received my serenity prayer charms excellent quality thank you! Thank you so much for the Stirling Silver Miraculous medal with chain. It is more beautiful in person than in the picture. Such detail. I have always been happy with everything that I have chosen from your company.